because an empty studio or fall-flat empty workshop with no clients is no fun at all. On this course you’ll discover where to find your first paying clients, how to let potential clients know that you’re available for business, exactly what to say to them, what to charge, and how to keep your clients once you’ve got them! Six weeks from now, following this course, you’ll have a practical, workable plan to help you build a successful image consultancy based around you, your personality, skills and experience, and the kind of lifestyle you really want, to get all the clients, bookings, and financial rewards you know you deserve. I wish someone had shown me all this when I started my image consultancy over 35 years ago. You could be the greatest image consultant on the planet but if you don’t have any clients you don’t have a business. You need to know where where to find clients, let them know what you have to offer, and know how to convert them into paying customers. It really naffs me off me when I talk with image consultants who are struggling to find paying clients when the solution is often so simple. That’s why I created the this Get More Clients course. Like so many of my courses you get lifetime access so you can come back whenever you want and re-do the exercises and challenges again and again. I do this myself every 12 months or so because, as we grow in our journey as image consultants, we naturally evolve and change. Let’s face it – if you keep on doing what you’ve always done, you’ll keep on getting the results you’ve always had. And, if you’re still reading this then that’s clearly not what you want. Isn’t it time you changed what you’ve been doing so far? Get More Clients will take you back to basics, starting with you. You will rediscover who you are, your strengths and skills, and what you’re really doing here! You will learn how to combine your personality and your innate talents with your learned skills and experience, making it easy-peasy to Get More Clients and create the results of your dreams. You will also discover where to find your first paying clients, how to let potential clients know that you’re available for business, exactly what to say to them, what to charge, and how to keep your clients once you’ve got them! 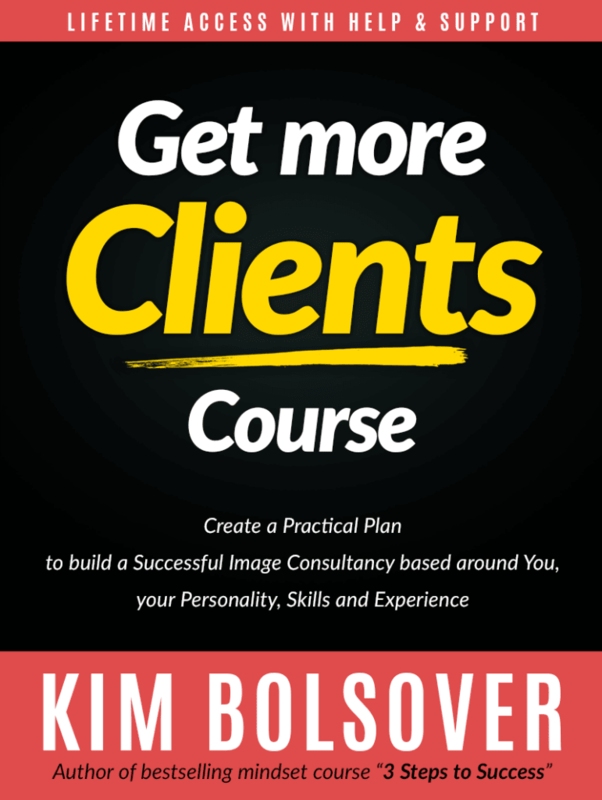 Just a few weeks (or even days) from now, you will have a practical, workable plan to help you build a successful image consultancy based around you, your personality, skills and experience. You will know exactly how to get all the clients you want with all the financial rewards and improved lifestyle you know you deserve. Buckle up! Get More Clients will change your life! 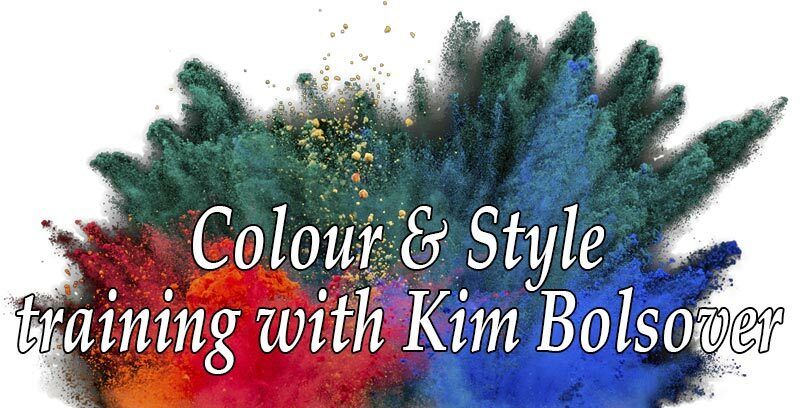 About the author: Award-winning business owner Kim Bolsover has over 35 years’ experience teaching and mentoring individuals, professionals and corporations how to create more success by improving their appearance, behaviour and communication. I wish you everything that I wish for myself. I’ve been talking about growing my business for 2 years because of all the things it would allow me to do but I haven’t got anywhere. I’ve done more for my business in the last 6 weeks (in this course) than the previous 2 years. Thanks Kim! Thank you Claire and thanks for taking one for the team though Kim is never too rough on us we need her straight talk for sure. For me this is mostly new since I’ve never done marketing or sells in the formal sense like I am now. I have much to learn but its exciting. I did the two lists exercise this evening and found this very useful, was able to work out why I want to run my own business and also the things that are holding me back. Just finished part 1 in the handout and boy that was a lot of thinking work (even for a teacher) but I did find it enlightening. I’m exhausted from it and have to go off to do some marking, so will need to get back to the rest later in the week, I won’t listen to the call until I’ve completed the handout. So far I’ve discovered that I enjoy things which allow me to be creative and expressive, learn empowering and healing life skills and then share and teach them to others. You need to know who you’re going to work with. You have to decide what you’re going to offer them, and to do that, we need to look at your innate talents and the skills you’ve learned along the way. Plus we need to establish what you want from your image consultancy, your goals around financial rewards, self-fulfilment, and the kind of lifestyle you want. So in week 1 I take you through a 7-step exercise to plan for success. Your niche – Before you can begin to learn how to attract clients, you must totally know what you are selling, and who you are selling your product or service to. Without this clarity in your own mind, how can you possibly explain to potential clients what you can do for them, and how can you expect your potential clients to understand what you have to offer them? A niche is ‘a distinct segment of a market’. Know what your customers want most and what you do best. Focus on where those two meet. What do I say to potential clients to get them interested in my product or service? My answer is in three parts – Are the people you are talking to your target market? Even if they are, is what you are offering what they want right now? You need to be able to explain the benefits of what you are offering to your target market in a way that they ‘get’ and understand. To be able to talk to potential clients in any way, shape or form, you must define exactly what you’re selling and then work out exactly who will buy what you have to offer – or you’ll be wasting your time and theirs. So in week 2 you will work through an exercise that gets down to the nitty-gritties of defining your niche. Lead generation – From Week 1 you know who you are and what type of product or service you want to offer to your customers and from Week 2 you have a clear picture of your ideal client (your target market) and have clearly defined your niche. Now, you need to find and attract your ideal clients. The business terminology for this process is ‘lead generation’. In marketing, lead generation is the generation of consumer interest or inquiry into products or services of a business. Leads can be created for purposes such as list building, e-newsletter list acquisition or for sales leads. What do I say to my target market to get them to buy from me? You need to explain to your prospects what you can do for them, and, to do that, you need to work out how you can help them, and, to do that, you need to know first of all what they actually need help with. Without new leads or prospects you can’t grow your image consultancy so in week 3 I walk you through an in-depth exercise concentrating entirely on the lead generation process. Lead conversion – Now you need to convert those leads into sales. The business terminology for this process is ‘lead conversion’. In marketing, lead generation is the process of converting a lead into an account, contact, and/or opportunity. Leads are typically generated from marketing events, such as trade shows or mailing campaigns. Sales conversation – In Week 4 you worked through a 7-step lead conversion exercise to help you convert your leads (prospects) into paying customers and you’ve already invited your prospects to connect with you at a 1-1 level.So you have their contact details from either (or both) offline and online marketing campaigns, and it’s time you invited your prospect to a sales conversation. The purpose of the discovery call is to establish where your prospect is now and where they would rather be, establish their desires (wants) and their challenges (issues), add value, and invite them into your offer, but only when you think this appropriate. So in week 5 you get a confidence boost as I take you deep into the secrets of how to create your own script for those all-important sales conversations. In Week 1 you discover who you are and what type of product or service you want to offer to your customers. In Week 2 you create a clear picture of your ideal client (your target market) and clearly define your niche. In Week 3 you learn how to find and attract your ideal clients with a lead generation process. Then in Week 4 you have a 7-step exercise to help you convert your leads (prospects) into paying customers and in Week 5 you have the steps to develop your own sales conversation script. Product Pricing – So in Week 6 It’s time to take on the challenge of pricing your product or service, a 7-step exercise to help you develop the pricing strategy for your products and services. In the final step of this exercise you will be ‘encouraged’ to re-visit the final step of Week 5’s workbook because you will have to recalculate how many discovery calls you now need to schedule and you may need to re-vamp the content of your discovery call. If ever you’re confused about pricing any of your products or services, remember this, if you’re asking, “How much should I charge for this product or service?” you’re asking the wrong question, you should be asking “How much value am I delivering to my client?”. Special Bonus #1 Putting it all together – In bonus week 7 of the Get More Clients course this is your opportunity to ‘put it all together’. It’s now time to put everything you have learnt together and create your very own business plan. Special Bonus #2 Completion exercise – If you want to build a successful business, you need to adopt a business attitude and that means continually looking at where you are now and where you want to be so that you can fathom out what you need to do to achieve your goals. Moving forward is also often about leaving ‘stuff’ behind. Decluttering your brain of all the “stuff” – good and bad – that happened last year can really help you move forward with a clear mind. So I’ve included a great completion exercise. It really helped me, so I’m sure you will love this. If you really, truly want to know what it actually takes to run a successful business (I’ve used image consultancy here as my example but this applies equally for other types of businesses too), then this audio webinar workshop is for you. If you have a trickle of clients (if any) and even less income from your business, then this webinar is definitely for you too. No more faffing about, it’s time for some good hard decision making. By the way, this is a WORKshop which means you will have some work to do! Special Bonus #4 Private Facebook Group – Join the exclusive ‘Get More Clients’ Facebook group. ~ Never underestimate the benefits of networking with other business owners around the world who have also stepped up to Get More Clients and improve their business results. We have Get More Clients members in the USA, Canada, United Kingdom, Greece, Hong Kong, South Africa, Switzerland, and more! Ask you questions, get support and encouragement – for life! Your investment in this 6-week course with lifetime access could change the very fabric of your business. You will know how to get more clients, have more confidence in yourself and your business, and with lifetime access, you’ll be able to repeat the process whenever you want. It’s designed specifically for business owners to help you Get More Clients. Simple as that. the Ultimate Image Consultant Training Program.